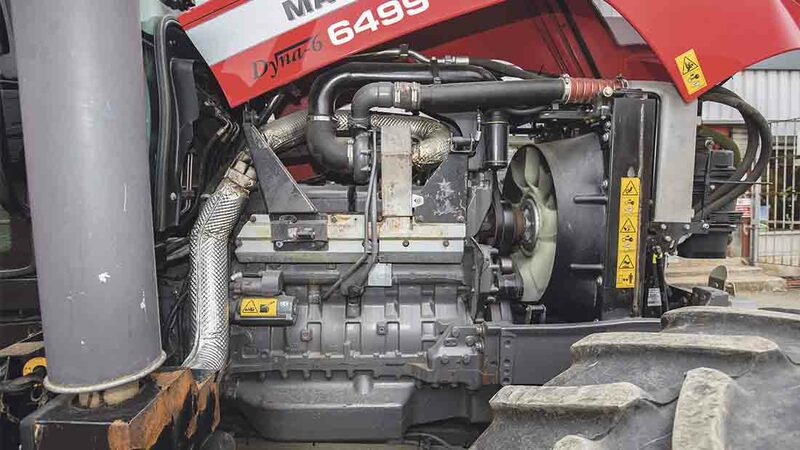 Packing up to 245hp with power boost, the MF6499 was viewed as dependable horsepower. Lister Wilder’s Bob Hayward guides Geoff Ashcroft around a used example. Massey Ferguson’s 6499 was introduced in January 2004 as the successor to the 8250 Dynashift and Powershift models. It offered a quiet cab boasting an in-cab noise level of 71dBa, plus the option of front axle suspension and cab suspension. Tipping the scales at 7.3 tonnes, the range-topping 6499 packed up to 245hp, with its size and performance making it a popular option for trailer work in addition to field duties. MF soon recognised this and supplied many 6499s with Transport Pack specification, which included Quadlink front suspension, closed centre load sensing hydraulics with 110 litres/minute oil flow, fixed wheel centres, pivoting front mudguards and cab comfort pack. The latter offered air conditioning, air seat, passenger seat and rear wash wiper. 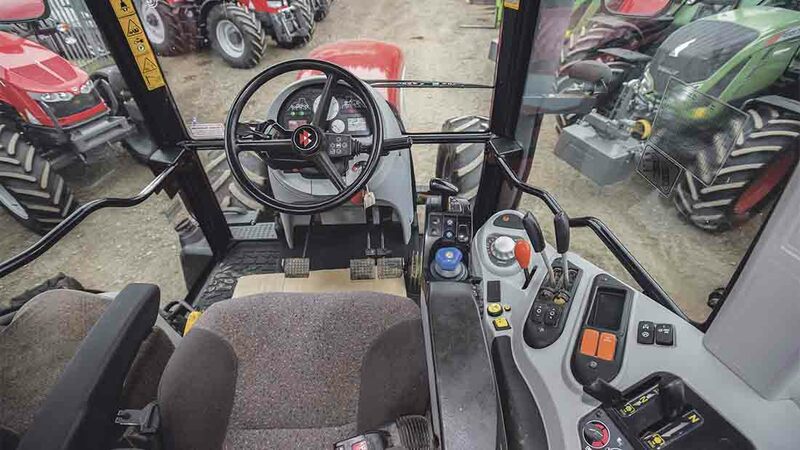 A few MF6499 models also gained Comfort Pack Plus, which brought climate control, electric adjustable mirrors and super deluxe Grammer heated and air suspended seat. A hydraulic extending pickup hitch extended versatility. Production ceased in 2011 and the MF6499 was replaced by the Stage 3b compliant, 7622. Throughout its life, the 6499 came equipped with a 7.6-litre, six-cylinder, turbocharged, intercooled Sisu 74.CTA engine, which in its early guise was EU Stage 2 compliant. In 2006, Stage 3 complaint power units arrived, bringing a power boost for pto work in addition to transport work where accessing third or fourth gear ‘high’ range would unlock more ponies. And what started as a 10hp increase soon grew to 15hp. Torque was also increased as a consequence. 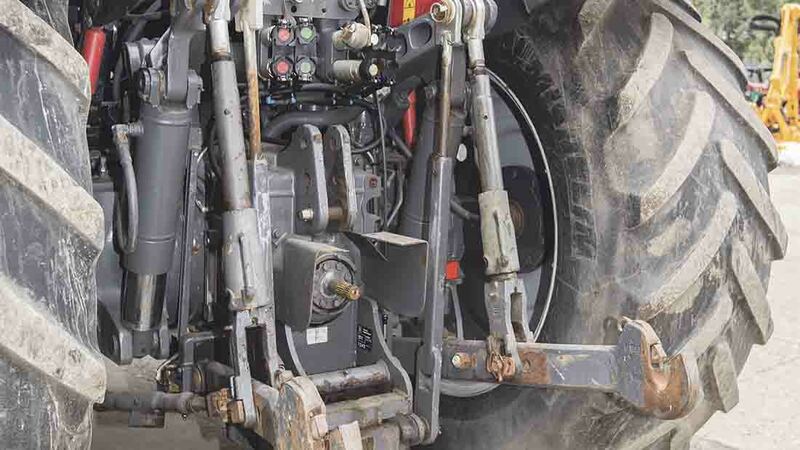 Lister Wilder’s Cirencester depot manager, Bob Hayward says the engine – and the tractor as a whole – has been viewed as ‘bomb-proof’ as long as servicing has been correctly carried out and fluid levels have been regularly checked and maintained. Engine oil change intervals were every 400 hours. Early models of 6499 were offered with a 32 by 32 Dynashift transmission, with the 24 by 24 Dyna-6 semi-powershift elbowing out Dynashift in 2005. With six powershift gears in four ranges and 50kph Dyna-6 allowing full-load shifting throughout the transmission. Clutch pedal ‘lower’ switches have been known to cause trouble and the transmission can show synchromesh wear on third gear. The latter can lead to a £7,000 bill as the transmission needs to come out to install £500-£800-worth of parts. Mr Hayward suggests such wear can be caused by over-heating the transmission, often a result of users asking too much of the 6499 when a more powerful tractor should be used. It is worth trying to find out some history about the tractor. Lower link sensing is robust, but wear and flexing can cause the retaining bolts to shear. If not rectified quickly, the lower link pins can move out, cutting through its integral sensing wires. A category three rear linkage with just over nine tonnes lift capacity is standard, and up to four spools – either mechanical levers or finger-tip – can be fitted along with a maximum flow of up to 150 litres. Rear PTO includes 540/1000/1000E speeds, with the latter at 1,600rpm. It is worth checking the correct front/rear tyre combinations are fitted to avoid zero-lead or negative lead on the front axle, which can lead to premature damage to the four-wheel drive clutch. MF tractors are designed to have a front axle lead from 1-5 per cent to cater for different tyre combinations, ensuring the front axle continues to pull correctly and get traction down. So pay attention to tyre wear and sizes on both axles. 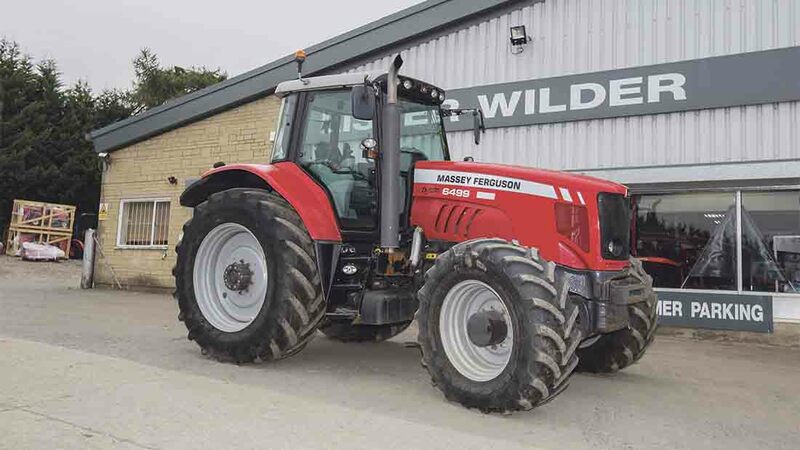 Mr Hayward says: “Any tractor which has been part of Agco’s Manager system for service, preventative repairs and extended warranty should have a comprehensive service history. The Fergie’s cab boasted a 71dBa in-cab noise level at launch, reducing to 70dBa as engine emissions saw greater refinement. A darker shade of grey material arrived for the cab interior in 2005, along with frameless cab doors, but the option of a super deluxe seat never quite put the 6499 in the same league as its contemporaries when it came to pampering the operator. Still, seat trim was robust and could withstand hard wear. Dual stage cab suspension added ride comfort and, using air suspension, it allowed the operator to toggle between two firmness settings to suit field or road use. Also in 2005, integrated tractor control system was fitted as standard with Datatronic 3 and provided entry-level field and headland management through the dashboard. It also afforded spool valve programming, trip data and oil flow priority functions. As with any second-hand purchase, a thorough inspection and test should reveal any pending faults, leaks and glitches. Service history and overall condition of course, remains everything. 2009 MF6499: Dyna 6, front linkage, four spools, 2,800 hours, £43,750.